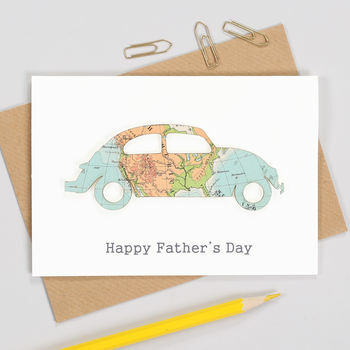 Personalised Father's day map Beetle car card. Personalise your fathers day map beetle card with your choice of map location and your own message. Our signature product, the Bespoke Map makes a perfect personalised gift for a friend or loved one. 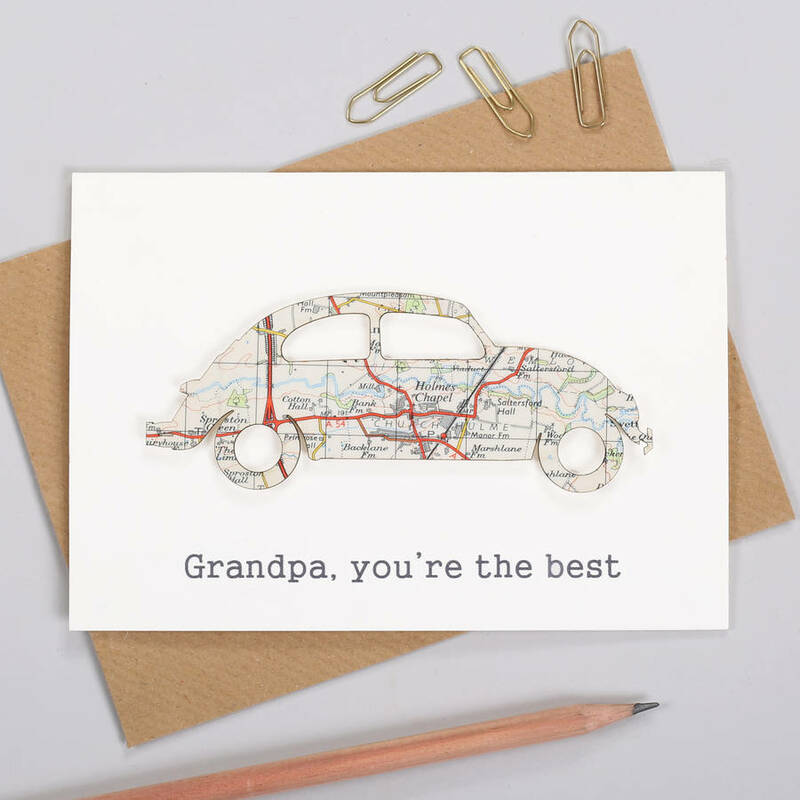 This fathers day card is a mini personalised handmade gift in itself. We have more than 15,000 maps of all over the world in our own collection at any one time, so we're bound to have the location you're after. And on the rare occassions we don't already have it, we'll do our best to source it for you. Available in three different background colours: red, off-white, natural brown. Alternatively you can allow us to choose the background colour card to perfectly complement the map. Would you like a frame for it? Create a stylish gift with a slim, glass frame - just choose the option to the right. Map location: please enter only one map location in the box provided, and we will use that as the focal point. Giving more than one map location may delay production of your card. Please remember that modern tourist names are not always marked on vintage maps, and that history occasionally changes names and territories. We can’t be responsible for political, religious or territorial persuasion and we do rely on you to provide us with specific information relating to such issues at the time of placing your order. We will always try to honour your request, discussing it with you if necessary. A specific building may not appear on the maps, and contemporary resorts hadn’t been built when most of our maps were drawn. 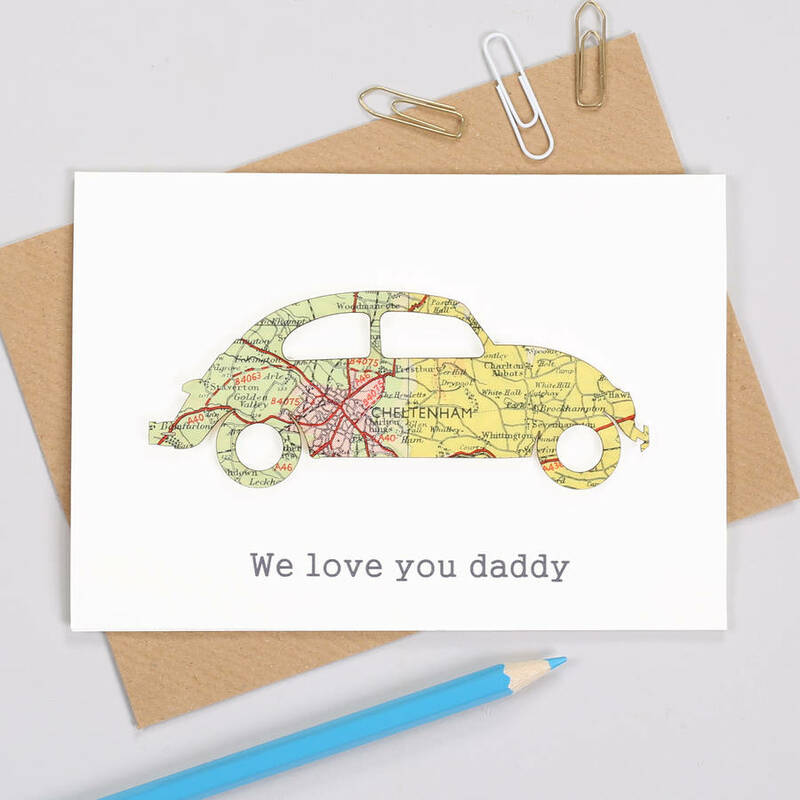 No sample service: as we use pieces of real maps never copies, and each one is uniquely handmade for you we regret we are unable to offer a sample service, or to send photographs for approval or comments. The Beetle shape is laser-cut from a vintage map of your specified location. The maps show natural age spots, folds and marks which are inherant in original vintage maps. The background card is made from 100% recycled material.